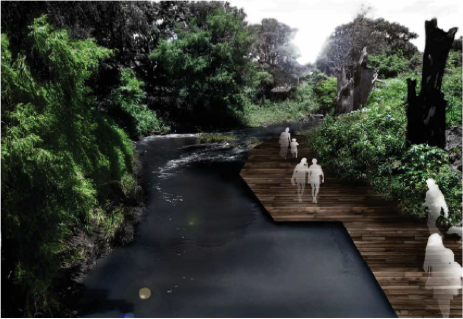 The state of Chiapas had invited the project team to develop a master plan for the redevelopment of several miles of the urban reach of the Rio Sabinal in a way that would address flooding and water quality concerns, while creating a new park system and pedestrian corridor through the heart of the city of Tuxtla. Regenesis helped the project team discover the longstanding historical, cultural and spiritual significance of the river. This led to a reframing of the project as a Collar de Flores, or necklace of flowers—a reference to the use of flower necklaces by indigenous people of the area in celebratory and sacred ceremonies. Each of the parks along the river was to be associated with a poza (a confluence with a smaller stream that creates a swimming hole) where in living memory people had played and come together as a community. Each park was also to be dedicated to a native flower significant to the region. At the same time, Regenesis helped the project team realize that questions of flooding and water quality needed to be addressed systemically, and not just along the banks of the river. The team extended its concept for the parks, envisioning them as neighborhood centers that would promote education and active community engagement in restoring integrity to the fabric of the watershed as a whole.